The philosophers at the University of Mississippi not only work to offer great classes on deep topics, but train students to engage in the discipline of philosophy for themselves. Our department has a philosophy club and honors society, we have an active philosophy forum series that allows students to interact with philosophers from around the United States, we take students to local conferences each year, and we also offer teaching assistantships for graduate students so that they can develop their own teaching and research skills. All of these activities are expensive, and we could certainly use your financial support. If you would like to help, please consider making a tax deductible donation through the University of Mississippi Foundation. Be sure to indicate that you would like your support to go to the Department of Philosophy and Religion. 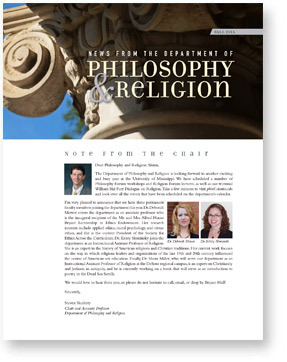 Specific questions about how you could best help promote philosophy at our university should be directed to Dr. Steven Skultety, Chair of the Department of Philosophy and Religion.